The Intercultural Lecture Series is designed to bring leading thinkers, educators and community leaders to UNC Greensboro for the purpose of advancing conversations on a variety of intersecting cultural and social issues. This series helps UNC Greensboro students become more aware of and engaged with the increasingly diverse and interconnected world around us all. 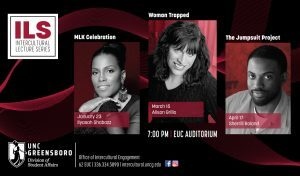 All events will be held in the Elliott University Center Auditorium beginning at 7pm! Ilyasah, the daughter of Malcolm X and Dr. Betty Shabazz, is an educator, activist, motivational speaker, and author of four award-winning publications: Growing Up X (Random House 2002) a coming of age memoir; Malcolm Little: The Boy Who Grew Up to Become Malcolm X (Simon & Schuster 2014) a children’s illustration book; X, a Novel (Candlewick Press 2015) a young adult historical fiction, and her newest release, Betty Before X (MacMillan 2018) a middle school historical fiction. She has received two NAACP Image Awards, Walter Dean Myers Honor, Library of Congress Inaugural Award, American Library Association Coretta Scott King Honor, and has been longlisted for The National Book Award. Ilyasah promotes higher education for at-risk youth, interfaith dialogue to build bridges between cultures for young leaders of the world, and she participates on international humanitarian delegations. She holds Master of Science in Education & Human Resource Development from Fordham University; Bachelors of Science in Biology from SUNY/New Paltz; and is currently an adjunct professor at John Jay College for Criminal Justice in New York City. Alison Grillo is a transgender comedian and speaker who simply lives to bring her unique story and off-beat sense of humor to institutions of higher learning. Alison appeared as the first transgender comedian on Last Comic Standing and tours the college comedy circuit frequently as an educator on LGBTQ+ topics. Her program combines multimedia, discussion, and stand-up comedy. Created by Sherrill Roland in 2016, the Jumpsuit Project continues to ignite conversations around issues related to incarceration. His performances challenge those who encounter the orange jumpsuit by encouraging them to address their own prejudices towards those incarcerated. The Jumpsuit Project challenges ideas around mass incarceration and works to generate a safe space to process, question and share. Prior to his own incarceration, Roland maintained a very general understanding about prisons and the justice system in our country – founded heavily in the media’s own depiction of imprisonment. Roland was unaware of the growing numbers of individuals incarcerated in the United States (both those proven guilty and wrongfully accused). Roland was naïve about the deep-seated social and political issues surrounding the culture of the prison system. His experience opened his eyes to the great impact incarceration has on those individuals behind bars, as well as their family members and friends. The Jumpsuit Project provides a window into the lives that have been impacted by incarceration. Through sharing his own story, and creating a space for others to share, light is being shed on the enormous darkness incarceration brings. Mending Masculinity is a collaborative spoken word tour featuring Kavi Ade & Vision. Through performance poetry, generative writing workshops, and critical dialogue the duo utilizes their separate lenses (as a Transgender Queer person and as a Cisgender Heterosexual person) to cultivate a conversation that encompasses all forms of masculinity, the performance of gender, and the inherent toxicity of gendered binaries in a patriarchal world. Recognizing the lack of emphasis placed on mental health and emotional awareness, Phillip Roundtree is speaking out. Driven by his professional and personal experiences, he champions mental health as an advocate for marginalized and underrepresented communities. The transparency Phillip brings to sharing his personal journey gives a face and a voice to living with depression and anxiety. Through his signature “This is what depression looks like” t-shirt, he offers hope to those who’ve yet to recognize their emotional and cognitive strength. Phillip has been practicing professionally in the areas of behavioral health and child welfare since 2005. In addition, Phillip is a NASM certified Performance Enhancement Specialist (PES), Pro Natural Bodybuilder, and Powerlifting Competitor, and credits his athletic accomplishments with playing an integral role in enhancing his mental wellness. He’s been coaching both athletes and non-athletes for three years. Academic success has also been a source of strength for Phillip. He received a bachelor’s degree in social work from Bloomsburg University (2005), a master’s degree in social work from Rutgers University (2007), and a master’s degree in exercise science from California University of Pennsylvania (2014). 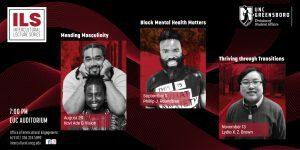 This presentation addresses the overly-stigmatized topic of mental health within the black community. Phillip will discuss key ideas relating to historical / current perceptions within the community, societal factors that impact minority wellness, and barriers impacting the utilization of services. He will also offer perspectives as a black man living in today’s society with a mental health diagnosis, while successfully navigating familial, career, and social responsibilities. Lydia X. Z. Brown is a disability justice advocate, organizer, and writer whose work has largely focused on violence against multiply-marginalized disabled people, especially institutionalization, incarceration, and policing. They have worked to advance transformative change through organizing in the streets, writing legislation, conducting anti-ableism workshops, testifying at regulatory and policy hearings, and disrupting institutional complacency everywhere from the academy to state agencies and the nonprofit-industrial complex. At present, Lydia serves as founding board member of the Alliance for Citizen-Directed Services, stakeholder representative to the Massachusetts One Care Implementation Council overseeing health care for Medicaid/Medicare dually-eligible individuals, and board member of the Autism Women’s Network. Lydia recently completed a term as Chairperson of the Massachusetts Developmental Disabilities Council, serving in that role from 2015 to 2017 as the youngest appointee nationally to chair any state developmental disabilities council. Lydia is a past Holley Law Fellow at the National LGBTQ Task Force, where they focused on reproductive justice and disability rights policy issues, and past Patricia Morrissey Disability Policy Fellow at the Institute for Educational Leadership, where they focused on employment opportunities for people with significant disabilities. Lydia also worked for the Autistic Self Advocacy Network for several years as part of the national public policy team, where Lydia worked on various issues relating to criminal justice and disability, healthcare disparities and service delivery models, and research and employment disparities.